Avoid infection and pain with root canal therapy from Brooks Dental in Winthrop. Two visits comfortably restore health and function to failing teeth. You have a tooth with numerous fillings or a large, deep cavity, or worse, your jaw aches and is swollen. You dread the words “root canal therapy,” but take heart. Modern endodontic therapy is very comfortable and take just 2 short appointments at Brooks Dental in Winthrop. Far from torturous, modern “root canals” relieve the pain and worry associated with failing teeth. If Drs. Howard Brooks, Barry Brooks or Julianne Doyle of Brooks Dental determines that your tooth is infected (abscessed), has an irreversible injury, is substantially decayed or has undergone multiple restorations, root canal therapy can bring new life to that tooth. 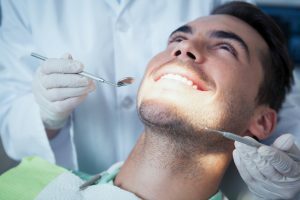 An in-office procedure, root canal therapy in Winthrop usually needs nothing more than local anesthesia. The dentist drills a hole down into one of the up to 4 root canals or inner pulp chambers. He or she then uses a series of very small files to remove the inner tooth pulp. This pulp contains blood vessels and connective tissue useful while the tooth is developing in childhood or adolescence, but not necessary in the adult tooth. After removing the pulp and instilling antimicrobial medication, the dentist seals the chamber with a stretchy material called gutta-percha. The process is repeated on the other tooth chambers as needed, and the dentist places a temporary filling or crown over the tooth. After a week or so of healing, the patient returns to Brooks Dental for placement of a permanent porcelain crown. The experienced team at Brooks Dental does everything it can to retain natural tooth structure. One’s own teeth preserve chewing and speaking ability, facial appearance and jaw bone integrity. As such, root canal therapy in Winthrop is a proven way to keep teeth in service for years. Contrary to popular dental myths, root canal therapy is not painful. In fact, it relieves pain and infection, allowing a tooth to remain in place and functioning for years. In addition, root canal therapy is less expensive in the long run than extracting teeth and replacing with dental implants or bridgework. Bridgework generally requires replacement with 10 years or so. These symptoms often indicate dental abscess which requires treatment with root canal therapy.